All 6 components must be passed and may be accumulated over a number of sessions. 1. Make a supervised safe entry with adult support. 2. Kick 2 metres on the back with adult support. 3. Float on the back with adult support behind the head. 4. Blow bubbles at the water surface. 5. Wet the head without submersion. 6. Travel without assistance 2 metres to a floating object. (It is recommended that a baby seat or other appropriate buoyancy aid to be used). 1. Make a sitting entry with adult support. 2. Blow an object for a distance of 2 metres. 3. Using a baby seat or other buoyancy aid rotate 180 degrees without assistance. 4. Move 5 metres along the rail or wall without assistance. 5. Travel 3 metres using arms and/or legs without assistance. 6. Submerge the face with confidence. 1. Make a supervised jump to an adult with or without support. 2. Kick 5 metres on the front holding a float (the adult may hold the other end of the float). 3. Blow bubbles with the mouth under water. 4. Float on front or back without adult support. 5. Travel 5 metres on the front to the side of the pool. 6. Show a torpedo shape on front or back when pushed to a partner. 1. Jump unaided, but supervised into the water. 3. Rotate through 360 degrees either horizontally or vertically. 4. Show a mushroom or a star float. 5. Travel without assistance 10 metres on the front or back. 6. Climb out of the water with assistance if required. This grade must be achieved without the use of buoyancy aids or adult support and assistance. 1. 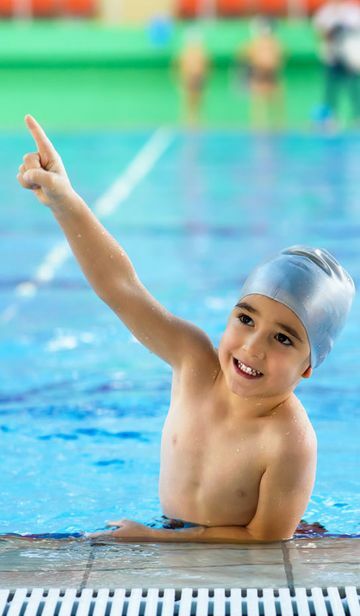 Show the sequence – to jump in the water, turn around, swim back to the point of entry and hold the rail or side. 2. Submerge completely and blow bubbles under the water. 3. Push and glide achieving a distance of 2 metres on the front or back. 4. Float on the front or back and regain standing/vertical position. 5. Swim 5 metres on the front or back using an over water arm recovery. 1. To enter shallow water from the poolside in a safe manner (assistance may be provided, this may be via the steps or from the poolside). 2. To move across the pool with the water surface no lower than shoulder level. 3. To submerge the face in the water and blow bubbles for 3 seconds. 4. To push and glide from the poolside or bottom on the front and change to a resting or standing position. 5. To push and glide from the poolside or bottom on the back and change to a resting or standing position. 6. To travel on the back a minimum distance of 5 metres. 7. To travel on the front a minimum distance of 5 metres. 8. To rotate from the back to the front position and gain a resting/standing position. 9. To propel a floating object (e.g a ball) for 3 metres by any method. 10. To demonstrate a horizontal or vertical stationary floating position for 10 seconds. 1. To enter shallow water unaided from a standing or sitting position without the use of steps. 2. To submerge the head completely and blow out under water for a minimum of 3 seconds. 3. To hold a tucked floating position for a minimum of 5 seconds (this may be on the front or back with the face submerged or kept out of the water). 4. To swim 1 width on the front using a crawl type front paddle propulsive action. 5. To swim 1 width on the back using a crawl type leg action. 6. To swim 1 width on the front or back using a breaststroke type action. 7. To swim 1 width full stroke on the front or back with arm recovery over the water. 8. To demonstrate a horizontal or vertical floating position for 20 seconds. 9. To demonstrate a 360 degrees turn or roll-from a horizontal or vertical position without making contact with the pool bottom. 10. To swim 2 widths without pausing using any stroke or strokes. The phrase “good style” implies that the stroke is easily recognisable as one of the four major competitive strokes but does not necessarily fully comply with ASA law. The stroke should be co-ordinated, smooth, efficient and completed without undue stress. 1. To jump into the water of at least full reach depth. 2. To swim 4 widths without a pause using any stroke or strokes. 3. To submerge in shallow water and retrieve an object from the pool bottom using both hands. 4. To tread water out of standing depth using arms and/or legs for 20 seconds. 5. To swim 2 widths on the front demonstrating good technique. 6. To swim 2 widths on the back demonstrating good technique. 7. To swim a minimum of 10 metres showing three changes of direction without touching the side or bottom of the pool. 8. To scull head first for 5 metres. 9. To swim through a hoop submerged in water of shoulder depth. 10. To swim continuously for 1 minute using 2 different strokes and with good style. The phrase “good technique” implies that the stroke complies with ASA law. 1. To jump into water of at least full reach depth and swim 25 metres without touching the side or bottom of the pool. 2. To surface dive in the water of at least full reach depth demonstrating good technique. 3. To perform a forward somersault using a push and glide if necessary. 4. To swim breaststroke or front crawl for 25 metres showing good technique. 5. To swim backstroke for 25 metres showing good technique. 6. To scull head first for 5 metres and return sculling feet first. 7. To swim a minimum of 5 metres using a dolphin leg action. 8. To swim 2 widths of any stroke including a “correct” turn complying with ASA law. 9. To enter water of at least full reach depth and tread water for 20 seconds followed by a 25 metres swim. 10. To swim 5 metres under water. 1. To tread water for 30 seconds followed by a 25 metres swim which includes passing through a submerged hoop. 2. To perform a backward somersault using a push and glide if necessary. 3. To perform a surface dive in water of at least full reach depth followed by an underwater swim of at least 5 metres. 4. To swim 50 metres in 90 seconds. 5. To swim 25 metres using an inverted breaststroke or backstroke. 6. To perform a head first entry into water of at least full reach depth and swim 25 metres of front crawl. 7. To swim 1 width of front crawl finishing with a forward somersault into the poolside and a push and glide away on the back or front. 8. To swim 1 width of butterfly. 9. To jump into water of at least full reach depth attaining a good height and upright position in flight. 10. To swim 25 metres propelling a ball and maintaining close control throughout. 1. To swim 75 metres within 2 minutes using three different strokes and demonstrating good technique. 5. To swim 3 widths of breaststroke showing 2 breaststroke turns and demonstrating good technique. 6. To swim 2 widths butterfly. demonstrating 2 changes of direction of at least 90 degrees. 9. To plunge dive into water of at least full reach depth, holding the glide for 5 metres. 10. To plunge dive into water of at least full reach depth, and tread water for 1 minute. Important for the following grades, sections A and B may be completed on two separate occasions, but each section must be completed without pause and in the order listed. 1. To jump into water of at least full reach depth. 2. To swim 10 metres, followed by a surface-dive into water of at least full reach depth and under water swim for a distance of 5 metres. 3. To tread water in a vertical position for 3 minutes. 4. To scull head-first on the back for 15 metres, with the feet at, or near, the surface throughout. 5. To swim 400 metres using 2 strokes. Changes of stroke can only occur at the completion of a length of the pool. A minimum of 100 metres is to be swum on each stroke. 6. To climb out at the deep end without assistance. 1. To plunge dive into water of at least full reach depth. 2. To swim 100 metres in less than 3 minutes using any stroke. A change of stroke may only occur at the completion of a length of the pool. 3. To tread water for 2 minutes with one hand behind the back. 4. To swim 10 metres, followed immediately by 2 surface dives into water of full reach depth, one head first and one feet first bringing an object to the surface on each occasion. 5. To scull head first on the back for 10 metres and return by sculling 10 metres feet first. A horizontal position must be maintained throughout. 6. To swim 800 metres: 400 metres on the front and 400 metres on the back. A change of stroke may only occur every 50 metres. 7. To climb out at the deep end without assistance. 1. To plunge dive into water of at least full reach depth and swim 100 metres in two minutes, thirty seconds or less, using two different strokes, 50 metres of each. 2. To tread water for 3 minutes with one hand remaining above the head throughout. The arm raised may be changed no more than five times. 3. To scull head first on the back for 10 metres, move into a tucked position and turn through 360 degrees keeping the head above the water. Return to the starting point by sculling feet first with the feet at or near the surface throughout and the hands close to the hips. 4. To swim 10 metres, perform a forward somersault without touching the pool bottom and continue to swim in the same direction for a further 10 metres. 5. To swim 800 metres using three of the following strokes: front crawl, backstroke, breaststroke, butterfly. English backstroke or sidestroke for a minimum distance of 200 metres per stroke. A change of stroke may only occur every 100 metres. This swim to be completed in 25 minutes. 1. To make a straddle entry into water of at least full reach depth, swim 5 metres into a piked surface-dive to retrieve an object weighing approximately 2 kg from water of full reach depth; carry the object using backstroke or sidestroke for a distance of 20 metres to land it on the poolside. 2. To scull 10 metres head-first on the back; complete a back somersault finishing in a back layout position ; perform a roll to take up a front layout in a fully extended prone position; carry out a front somersault finishing in a front layout position; tuck and rotate backwards into a back layout position and continue to scull feet first for 15 metres (throughout all sculling and layout positions, the hands must remain close to the hips and the feet must be kept together on or near the surface of the water). Note: Tests 3 and 4 are to be completed in a total time of 20 minutes without a pause. 3. To swim 200 metres front crawl, 200 metres backstroke, and either 100 metres breaststroke or 50 metres butterfly. A change of stroke may only occur every 100 metres (except for butterfly). 4. To swim 500 metres freestyle, during which, surface-dive twice head-first and twice feet first; on each surface-dive, swim through 2 hoops 4 metres apart without surfacing;(the tops of the hoops are to be at least 1 metre below the surface of the water). 1. To enter water of at least full reach depth from the side of the pool by sliding in from a sitting position. 2. To tread water for 2 minutes. 3. To swim 25 metres to a floating object. 4. To take up and hold the H.E.L.P position for 5 minutes in water of at least full reach depth. 5. To swim 50 metres retaining the floating object. 6. To climb out of the water of at least full reach depth without using the steps or rail or any other assistance. 7. To answer 3 questions on when the skills learned might be used. 1. What is the safest way of entering unknown water? 2. Why should you keep your clothes on in cold water? 3. Should you take any clothing off in an emergency and if so which? 4. Why should you use only gentle movements when swimming in cold water? 5. Why do you keep your legs pressed close together in the H.E.L.P position? 6. Why do you keep your arms close to the sides in the H.E.L.P position? 7. Why should you keep your head out of the water as much as possible? 1. To enter water of at least full reach depth using a straddle entry. 2. To tread water for 2 minutes with one arm out of the water (the raised hand to be above the head throughout, candidates may change arms twice throughout). 4. To take up and hold the H.E.L.P position for 6 minutes. 5. To participate in a “HUDDLE” for 2 minutes using any floating object for support with at least 2 other similarly clothed swimmers who may be candidates. 6. To swim 100 metres retaining a floating object. 7. To climb out from water of at least full reach depth without using the steps or rail. 8. To answer 3 questions on when the skills learned might be used. 1. Which parts of the body lose heat most quickly? 2. Why should you not surface dive in cold water unless it is essential? 3. Why should you avoid jumping into unknown water? 4. If you have to swim during an emergency, why should you take the floatation aid with you? 5. 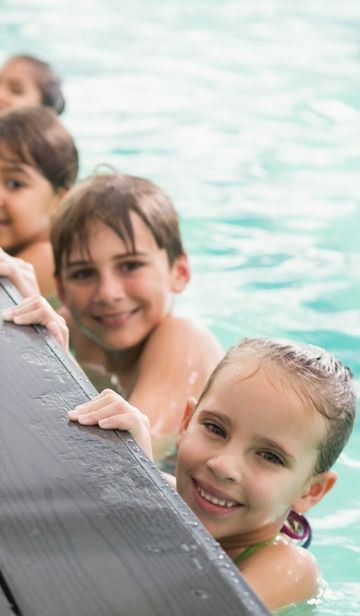 When is the only time you should swim without a floatation aid? 6. Why is it most effective to H.E.L.P or “HUDDLE” wearing a lifejacket?